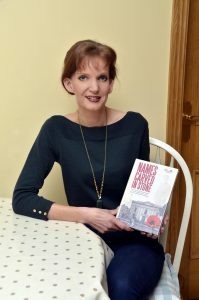 The book began with the more modest ambition of an article for the Church magazine, profiling the story of one of the soldiers named on the War Memorial. In many projects like this the inspiration often comes from a family story. I had grown up hearing of three great-great uncles who fought in the First World War—William, Joseph and John Johnston of Disraeli Street, on the Crumlin Road. Joseph’s death at Gallipoli in August 1915 was a devastating loss for the family. The next generation of the family were to suffer again during the Belfast Blitz of 1941 when their house in Duncairn Gardens suffered a direct hit and was completely destroyed. Our family left Belfast for Newtownards and the connection with their Belfast community was broken. 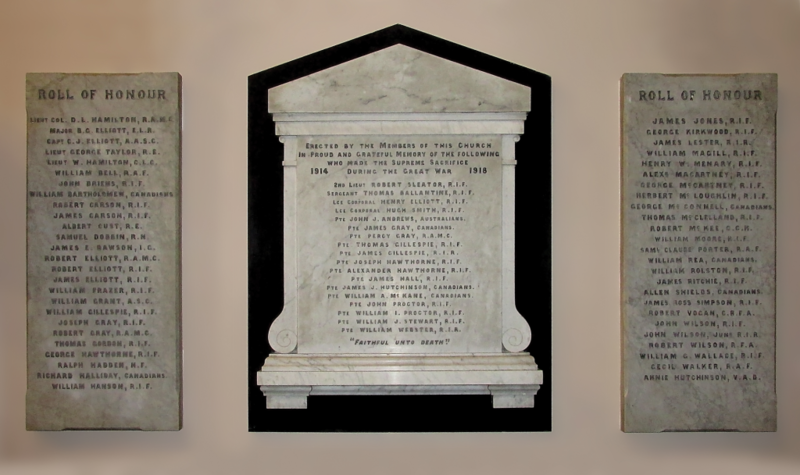 William, Joseph and John’s names are carved in stone on the War Memorial in Nelson Memorial Presbyterian Church in North Belfast. However, this Church closed on 25th May 2014. Tragically there is now no congregation to remember them and to acknowledge their sacrifice. This experience inspired me to profile a soldier from The Mall Presbyterian Church in Armagh, where I now worship, and to bring his story to light again. Thanks to the internet, local experts and living descendants, I began to uncover the largely forgotten lives on some of the sixty-nine names on the War Memorial and Roll of Honour. The magazine article quickly developed into a special church service of remembrance. The “Names Carved in Stone” service was held on 9th November 2014 and the lives of nineteen men and one woman were told and remembered. The result was a poignant and powerfully moving evening. Nonetheless there were forty-nine additional names on the memorial whose lives were equally worthy of being remembered. This book picks up where the service left off. The goal: To tell the story of the war through the stories of the sixty-nine individuals from The Mall Presbyterian Church who volunteered. 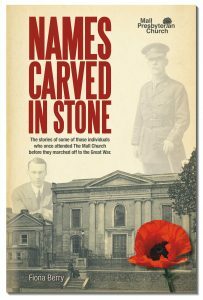 The men featured in Names Carved in Stone were baptised in the Mall church, attended school and Boys’ Brigade together before enlisting for active service. They came from every area of church life—the Minister’s three sons, the Clerk of Session’s three sons, the treasurer’s three sons, the sexton’s son, two members of the church committee and a Boys’ Brigade officer. They featured in all the services and covered many areas of the conflict including the Western Front, Egypt, Salonica, India, the Dardanelles and Mesopotamia. Eighteen men paid the ultimate sacrifice and never returned to their family pews in the Meeting House. Their names are carved in stone on the War Memorial. Fifty men and one woman survived and returned to Armagh, changed forever by their experiences. Their names are carved on the Roll of Honour. The story of the memorial tablets is also told. The stone mason was a member of the congregation and he carved his own son’s name onto the Roll of Honour. The published book is by no means the end of the project. I do not claim to be an expert in the history of the time, and so inaccuracies are inevitable. New information is still being found and there are a couple of stories yet to be told. There are some names on the Roll of Honour that I could not find very much information on, in particular—John Wilson, John Wilson Jnr and Robert Wilson, all of Lonsdale Street. Frustratingly I could find no other trace of them in the Mall Church or in Armagh. I believe that they could be a father and his two sons. Hopefully their story will be unearthed in time. We plan to put all new information found and any corrections in a section on the church website. I must express my grateful thanks to Rev Peter Gamble, the Elders and Committee of The Mall in their enthusiastic support for this project. I was given free rein to examine all the old books, registers, accounts and minute books which helped me to map out the stories and the connections between them. Using the church records and genealogical sources I could build up a profile of each of the soldiers featured. The result is a moving tribute to the sacrifice made by an entire generation. Many individuals in the congregation and in the community also helped and provided me with lots of significant and useful information. However, the most important thanks must go to the families whose stories feature in this book. They have all been enthusiastic and helpful. Some I have met, others have been through email, but all have given generously of their time and knowledge. Many have expressed delight that their family story is finally being shared and preserved and it has been a privilege to have been part of that process. I can remember standing in front of the Memorial Tablets over two years ago not knowing who to pick to feature in a magazine article. None of the names meant anything to me. But I knew that if I had been standing there 100 years before these could have been the names of my brothers or my sons. In learning and bringing to life these men’s lives and their role in the Great War they have become my brothers and my sons. I hope that as you read their stories and understand their lives that you too will feel a similar attachment and appreciate the sacrifice they made for our freedom. Names Carved in Stone is hard backed, 160 pages, full colour, and amply illustrated. It costs £10/12 Euros (including post & packaging within UK and RoI). All profits will be donated to SASRA (Soldiers and Airmen’s Scripture Readers Association). It will be of interest to those who enjoy genealogy, the First World War, congregational life and local history. Books can be ordered from the Mall Church. Contact them via the church website, where you can also download the first update to the book.